The new strikes deepen Washington’s involvement in the conflict and represent a significant escalation for President Barack Obama. U.S. F/A-18 fighter jets take off for a mission in Iraq from the flight deck of an aircraft carrier in the Persian Gulf. WASHINGTON EXPANDED ITS month-long air campaign to Iraq’s Sunni Arab heartland today, hitting Islamic State fighters west of Baghdad as troops and allied tribesmen launched a ground assault. The new strikes deepen Washington’s involvement in the conflict and were a significant escalation for President Barack Obama, who made his political career opposing the war in Iraq and pulled out US troops in 2011. Previous strikes since the US air campaign began on August 8 had been mainly in support of Kurdish forces in the north. 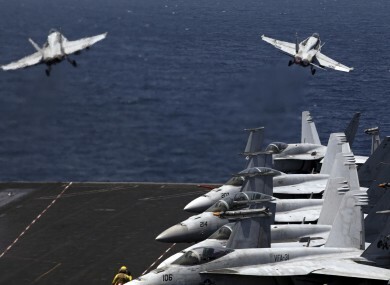 US warplanes bombed IS fighters around a strategic dam on the Euphrates River in an area that the jihadists have repeatedly tried to capture from government troops and their Sunni militia allies. “We conducted these strikes to prevent terrorists from further threatening the security of the dam, which remains under control of Iraqi security forces, with support from Sunni tribes,” Pentagon spokesman Rear Admiral John Kirby said. “The potential loss of control of the dam or a catastrophic failure of the dam — and the flooding that might result — would have threatened US personnel and facilities in and around Baghdad, as well as thousands of Iraqi citizens,” he added. Iraq moved today to capitalise on the strikes, launching a drive against militants in the Haditha area. “Joint forces backed by air support and tribesmen launched a wide attack to clear the areas surrounding the Haditha district,” security spokesman Lieutenant General Qassem Atta told AFP. The troops and militia retook the town of Barwana, east of Haditha, from the jihadists, who abandoned their weapons and vehicles in their retreat, an AFP correspondent reported. Troops lowered the black IS banner from the town’s main checkpoint and raised the Iraqi flag. The only previous US strikes against IS outside of northern Iraq were carried out in support of an operation by the army, Shiite militia and Kurdish fighters to break a months-long siege of the Shiite Turkmen town of Amerli, north of Baghdad. Dams have been a key target for the jihadists, and there has been major fighting around Iraq’s largest dam, on the Tigris River north of militant-held second city Mosul, which has been a major focus of the US air campaign. The Haditha and Mosul dams are important sources of both power and irrigation water for farmers. Western governments have come under mounting pressure to take strong action against IS, which controls a swathe of neighbouring Syria as well as significant territory north and west of Baghdad. The jihadist group has carried out a spate of atrocities in areas under its control, some of which it has videotaped and paraded on the Internet. The United Nations has accused IS of ethnic cleansing in northern Iraq, detailing a campaign of mass detentions and executions in Christian, Turkmen and Yazidi Kurdish areas. The beheading of American journalists James Foley and Steven Sotloff has added to the pressure on Western leaders. Western governments have voiced mounting concern that nationals who have gone to Syria or Iraq to fight with IS will return home to carry out attacks. A French journalist held hostage in Syria by IS said in comments published Saturday that one of his captors was a Frenchman of Algerian descent. Email “US steps up air-strike campaign to target fighters in Iraq's Sunni heartland ”. Feedback on “US steps up air-strike campaign to target fighters in Iraq's Sunni heartland ”.